choice to work with people on the Feldenkrais® table when they are fully dressed. Dr. Shelhav will also talk about her own life’s work, Child’Space. Why work with babies in the early stages of life? Babies choose a particular motion or a behavioral solution that turns into a habit that was appropriate for a certain phase but may be the wrong choice for the future. The Child’Space method offers babies a new variety of possibilities and solutions to correct the habits that do not serve them well. 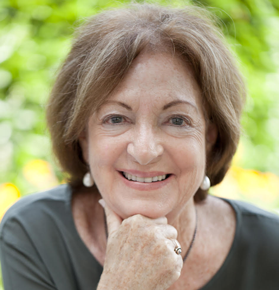 Chava Shelhav, senior teacher of the Feldenkrais Method®, was born in Israel and lives in Tel-Aviv. Dr. Shelhav was a member of the first group of students trained personally by Dr. Moshe Feldenkrais, worked with him for many years and acted as his assistant in programs throughout the world. She is one of a handful of people who are responsible for promoting the Feldenkrais Method® to the international status it holds today. Chava Shelhav introduced the method to a variety of institutions in Israel and Germany, among them hospitals, child development centers, kindergartens and schools.Dr. Shelhav has been the Educational Director for Feldenkrais® professional training programs in Israel, the UK, the USA and Germany, as well as guest trainer for numerous international programs. She has been the head of the Center for the Feldenkrais Method in Germany, Feldenkraiszcentrum, for the last 30 years. She received her PhD at Heidelberg University in Germany. Her thesis led to her book (in German), Movement as a Model of Learning, (1999). She earned her MA degree from Boston University based on her work with children with Cerebral Palsy and her master’s thesis, “Working with Brain Damaged Children Using the Feldenkrais Method,” (1989). Her method of teaching utilizes aspects of the body-mind relationship, and emphasizes the influence of early development on the individual and on social personality. Dr. Shelhav has achieved distinction through her work with infants and children, especially disabled ones. During the last 40 years, she has trained thousands of students, and witnessed the growing need and interest in working with babies and with special needs babies. In 2002, she developed Child’Space® – Shelhav Method, a unique method of developmental coaching that applies Feldenkrais theory while working with babies and their caregivers. Since then, she has been training practitioners and therapists in the Child’Space method in Israel, the USA, Japan, Netherland, Russia, Austria and Argentina. Book: A Guide to Awareness Through Movement®, 18 Lessons Based on the Feldenkrais Method. Chava Shelhav and Dalia Golomb. The detailed instructions and abundant photos accompanying the lessons in this well-designed volume set it apart from many other guides intended to support the user in doing lessons on their own. DVD: The Feldenkrais Method with Children Who Have Learning Disabilities. Chava Shelhav. This inspiring one-hour DVD documents the most ambitiously organized application of the Feldenkrais Method with children ever undertaken. It follows a group of children over a six-month period. Dr. Shelhav uses innovative Awareness Through Movement® lessons and situations to influence the children’s sensory, motor, emotional, and cognitive development.